NAIROBI, Nov 21 2012 (IPS) - A new website linking corruption and other scandals to high-ranking Kenyan politicians, created by a team of political provocateurs, has become one of the most-visited web pages in the country. MaVulture.com, which means “many vultures” in Swahili, aims to collect, condense, and air the past wrongdoings of Kenya’s political class. 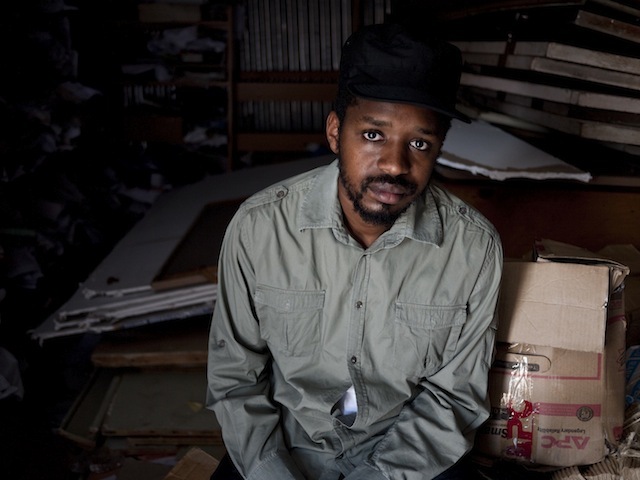 Going live on Nov. 13, the site is the latest project from activist Boniface Mwangi, known for his political graffiti murals around Nairobi and his photographic exhibitions that documented the violent aftermath of the 2007 presidential elections. Following a disputed election result in December 2007, riots and politically motivated tribal disputes broke out, leaving around 1,200 people dead and displacing 600,000. Mwangi, 29, a freelance photographer, was twice awarded, in 2008 and 2010, CNN’s Mohamed Amin Photographic Award, named after a Kenyan photojournalist, for his work covering the post-election violence. “Yo have y’all checked out mavulture.com?” tweeted Kenyan entertainment magazine Blink. “I think you need to check it out before you cast your vote next year.” Kenyans will be going to the polls to elect a new president in March 2013. The website so far features profiles on 17 politicians, including Uhuru Kenyatta, the son of Kenya’s first president, a current presidential candidate, and also one of the men under an International Criminal Court investigation for crimes against humanity during the 2007 post-election violence, which Kenyans refer to as “the Violence”. Money laundering, land grabbing, drug trafficking and murder are just a few of the accusations Mavulture.com pins on its targets. Aside from articles, the site includes videos, infographics on each politician, and Wild-West-style wanted posters available for download. It is financed by anonymous donors. Mwangi told IPS in an interview at his Nairobi office that the goal of the website was to educate Kenyans about the baggage their political leaders and candidates are carrying leading up to the presidential elections. “We’re going to put online the records of every person involved in the government, every corruption case they’ve been in, and every accusation about them,” Mwangi said. According to Transparency International, the Berlin-based non-governmental organisation that documents global corruption, Kenya’s score in 2011 for perceived corruption was 2.2 out of 10, with 10 being clean. Overall, 153 out of 183 countries on the index ranked as less corrupt than Kenya. Transparency International estimated that corruption is costing Kenya up to 357 million dollars per year. Mwangi said he moved into political activism out of frustration and anger after witnessing the post-election violence. In 2009 he founded Picha Mtaani, a traveling photo exhibition of the riots and killings, as a way to remind Kenyans of what happened. 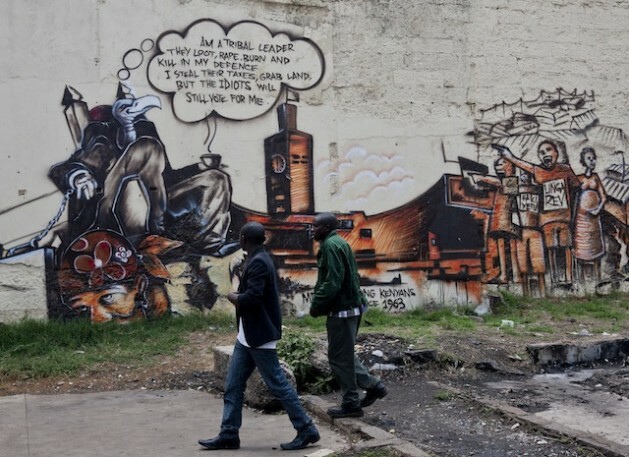 Turning his gaze toward corruption, Mwangi then organised a group of graffiti artists to create controversial murals around Nairobi depicting the nation’s political elite as vultures and criticising the populace for voting them into office again and again. In June, he led a rally that carried 49 black coffins to parliament while in session. Each coffin represented every year the politicians enjoyed impunity since independence in 1963. On them they stenciled, “Bury the vulture with your vote,” and each coffin was labeled with a political scandal. Mwangi said that he wants to provoke a response among Kenyans, because their apathy toward clear cases of political and financial abuse only emboldens those who seek to take advantage of the system. “Recently, teachers and doctors were striking over low pay, and the members of parliament sat down and over 30 minutes awarded themselves a pay raise,” Mwangi said. Fear of the consequences of speaking out, he said, is one of the main reasons for Kenyans’ silence. So Mwangi said he is thinking of planning a protest where everyone will wear masks.